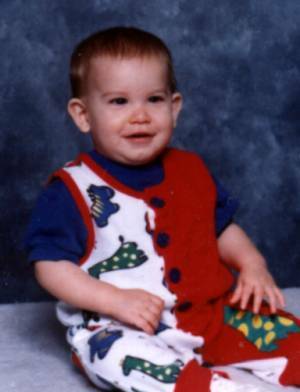 Jacob was born back in January of 1994, a little over two weeks early. My pregnancy had been complicated by multiple bouts with allergies, bronchitis, and sinusitis that were treated with antibiotics (Erythromycin) by mouth. I was the unrestrained passenger in a head on collision at seven weeks gestation but refused any medications that were offered in the hospital because I wanted to be safe with him since I had been foolish enough to not have on my seatbelt. I did a lot of heavy lifting as a primary care rehabilitation nurse and had been kicked several times by combative patients. A week before he was born, I was kicked in the abdomen so hard that it threw me into the wall and knocked the breath out of me. The day that I went into labor I was on my fifth round of antibiotics for bronchitis brought on by the flu. 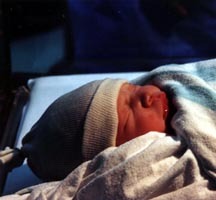 Despite that, he was a healthy newborn with APGAR scores of 9 at one minute and 10 at five minutes. He weighed in at 6 pounds and 11.2 ounces and was 20 1/2 inches long. He was a strong baby with an insatiable appetite. He was breastfed so we bonded immediately after his birth. 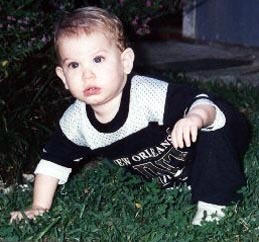 At that point in time, Louisiana only tested high risk newborns and he didn't qualify. We were discharged home the following day with only a minor case of jaundice (hyperbilirubinemia) which we treated with filtered sun exposure and breastfeeding. The jaundice had disappeared in just a few days. His health history has been unremarkable except for a case of Respiratory Synctival Virus at the age of 5 weeks with bronchiolitis that required a four day hospital stay. He had no complications. Other than that he only had cold/allergy type illnesses and one bout of otitis media, which occurred after he was diagnosed with a hearing impairment. In the beginning, he was a quiet baby and was perfectly content in the world around him. He was rarely awakened by the normal commotion of having a brother fourteen and a half months older. As the months went by, we began to notice that he seemed to "tune us out" more and more. He rarely woke up without being touched and slept soundly in his cradle with it sitting right beside the television. But, he had become a very fussy baby as time went on and they were treating it as colic. We tried Mylicon drops and watching everything I ate so he wasn't getting gas from something I ate coming through the breast milk. He continued to fuss for several hours in the evening every day. He would cry out as if in pain and arch his back, then turn red like he was holding his breath. He acted like he didn't want to be held when he was having these fussy spells and there was nothing I could do to calm him. We finally tried the Levsinex drops which are used to treat cramps and muscle spasms in the bladder, bowel and stomach, to see if that helped, but it really didn't. Eventually, as he started eating real food, he stopped being fussy in the evenings. He also was NOT a happy camper if he had to ride in a car seat. He fought and pulled against the straps like a mad man. I usually gave in and held him because I couldn't stand the screaming any longer. Unlike my first child, he didn't seem to be comforted by musical toys unless they had a movement or flashing lights. My humming didn't soothe him like it had for my first child either. As more months passed, we continued to notice little things. He started to try babbling around 9.5 months of age but didn't really respond when you babbled back. After just a few weeks, the babbling was gone and he started making a high pitched squealing sound. He would squeal and laugh, squeal and laugh and it was starting to drive me crazy. Up to this time I had never really told anyone my fears. My husband and I joked that he was either the most stubborn and hard-headed person around, he was ignoring us or he was hearing impaired. As soon as we would decide that he was not hearing us, he would respond. He would turn when you called him at times, but most of the time he didn't. 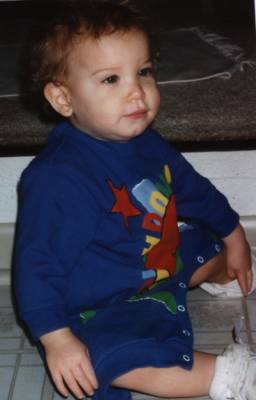 By the time he was 10 months old, we felt sure that there was a hearing problem. I mentioned to the Pediatrician that I was concerned that he didn't seem to be producing speech sounds very often and I worried that he had some degree of hearing loss. I knew it could not be a profound loss because he did respond at times. Remarkably, he turned when she jingled a Christmas bell near his ear and when she tapped the wall behind his back. I was told the "Some kids develop language slower than others. You are comparing your children and Josh is advanced in language for his age." It was true, Josh was talkative and Jake really never had to try to ask for anything. He would point and Josh would say "Jake wants his bottle", "Jake wants that toy", so it made sense to me. Sounded good to me because I really didn't want to hear that my baby was deaf. When he was 11.5 months old, I finally broke down crying at work and confided in my friends that I thought he was hearing impaired. That morning I had asked the childcare providers about how his vocalizations were in comparison to the other babies. They said he didn't vocalize much except for squealing and laughing but the other babies were babbling up a storm. I had called the daycare to ask how he was doing and all I could hear was Jake and his robust squealing in the background. I began sobbing as I held the phone. I told my friends that he responded to my husband's voice but rarely to mine, which was very painful to me. They all insisted that I bring him over after work so they could assess the situation and show me he was fine. Unbelievably, he turned around and laughed when they called his name. He responded to the claps behind his head as well. 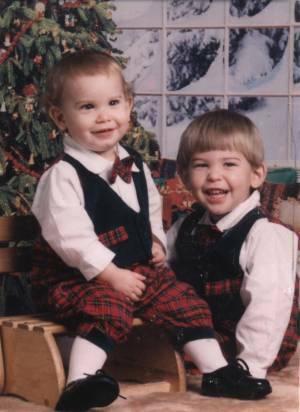 A few days later we went to the photographer for Christmas pictures and none of the noisemaker toys or her voice could get his attention. WAS I CRAZY? Why does he seem to hear sometimes and not others? Surely there must be something wrong with his hearing, why else would he be seemingly shutting me out? I thought that maybe it was the tone of my voice because the ladies that called to him had deeper voices than mine. I tried to lower the pitch of my voice and found that he did respond to me more but there were still those days that I swore he didn't hear anything. A week after his first birthday, he developed an upper respiratory infection and was taken to the doctor. At this appointment I again brought up my concerns about his not babbling or doing any type of vocal play. I told her what the daycare had said about his language in comparison to the other babies the same age. Since he had a stuffy head, hearing testing wasn't going to give us accurate results so she gave him antibiotics and a follow-up appointment in two weeks. Those were probably the longest two weeks I have ever been through. We must have dropped and/or clanked every pot in the house just to see if he responded. Usually he didn't, but occasionally he would. By the time he was well enough to return to the doctor, I could barely talk because I had strained my vocal cords trying to lower my voice so he would respond. 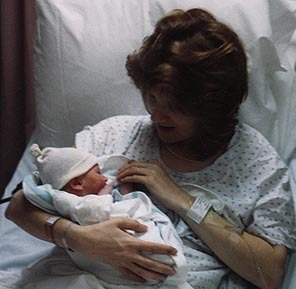 I'll never forget the day we returned to the doctors office, January 31, 1995. Jake was squealing his little heart out as we were waiting in the exam room. I knew that she had to hear him while she was in the adjoining room because I could hear her talking through the walls. When she walked in I asked, "Did you hear that squealing sound?" She replied, "Yes, what was that awful sound?" I pointed to my precious baby and told her that it was the ONLY sound he made anymore. She had me hold him with his back to her and called his name, clapped her hands and called his name again. He didn't turn to any of the sounds she made that day. Her jaw dropped and she said, "Oh my God, you were right". She immediately wrote a referral to the otolaryngologist. I went straight to the office and made an appointment for the next morning. It was strange because I felt relieved to know there was a problem and relieved to know that I wasn't crazy. He finally seemed "deaf" to someone else. I don't know if I slept any that night. I felt as if I had eagles, not butterflies in my stomach. I called my family to say we were going in for a hearing test the next day. I tried hard not to cry so that I didn't upset my Mother, but it wasn't possible. I had paperwork to fill out for the appointment and didn't feel up to it. It asked when we first suspected the hearing problem and why we suspected it. I went through videotape after videotape trying to see if he ever had a consistent response to sound. I watched from his birth up to his first birthday party, but I couldn't recognize anything that would give the impression he was either hearing or deaf. The only thing I accomplished was to make myself feel like a bad Mom because I couldn't tell if he ever heard or not. So, I sat there in my rocking chair and cried.